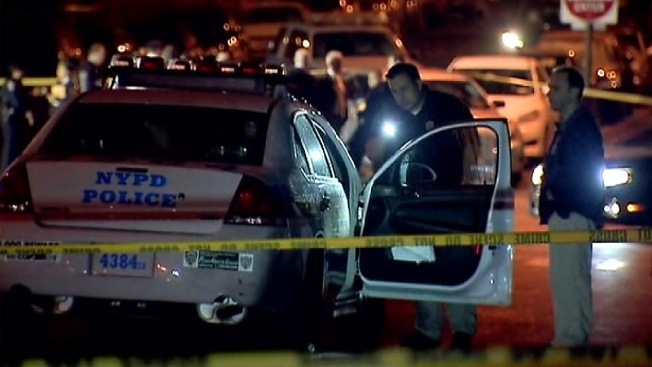 Police shot and killed a man who allegedly opened fire on them when they responded to a report of a shooting at a city housing development in the Bronx Thursday night, the NYPD says. Two officers were sent to the Castle Hill Houses at about 11 p.m., the department says. When they got there, they found a man who looked like a suspect described in the 911 call walking near a playground. Police say the suspect opened fire at the officers and fled, running down Randall and Olmstead avenues. Officers chased him and a second round of shots was fired; it wasn't clear if the suspect fired shots that time. The suspect, who was later determined to be 26 years old, was shot and killed. He was pronounced dead at the scene, police say. His name hasn't been released. Police recovered a .45-caliber handgun at the scene. Four other people were also injured in connection with the shootings, but EMS could not say if they had been shot.